If you've been injured due to the negligent actions of another, choosing the right injury lawyer will be one of the most important decisions you ever have to make in your life. The mounting medical expenses you face while you recover can be financially crippling, especially when compounded by lost wages from missed work. You'll need an experienced injury lawyer on your side who can fight aggressively for your rights. 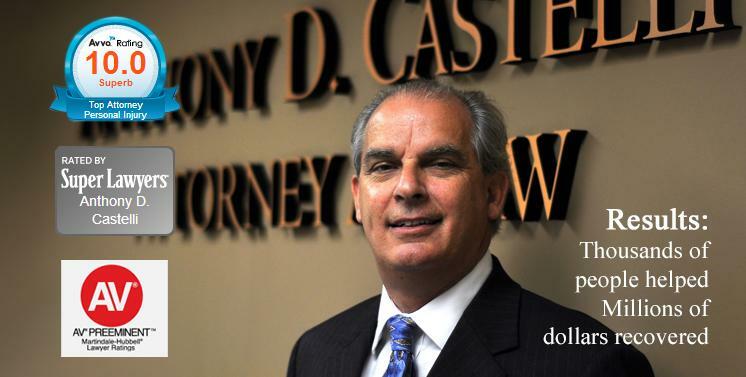 Anthony Castelli is a Cincinnati injury lawyer with more than 30 years of litigation experience. He knows the tactics used by unscrupulous insurance companies to unfairly reduce your compensation, and he can help you avoid becoming a victim of these tricks. The best way to learn about your rights and options is to speak to Mr. Castelli in person. Please call (513) 621-2345 today to schedule your free personal injury consultation at our Cincinnati office. Due to the high stakes associated with the success of your personal injury claim, it's crucial that you work with an attorney who has the skills and background necessary to help you maximize the value of your compensation. There are many lawyers in the Cincinnati area vying for your business. As a result, you'll need to do your research before deciding which injury attorney is right for you. The following tips will help you avoid some common mistakes that are made when choosing an injury lawyer. Mistake #1: Choosing a Lawyer Based on Numbers of Years in Practice Alone. No question about it, your injury lawyer must have “real world” experience. Before you choose an attorney, ask them how many cases they have taken to trial in front of a jury. This can be just as important as the number of years the attorney has been in practice. You want to make sure your lawyer has the skills necessary to pursue your compensation in court if a settlement isn't in your best interests. Mistake #2: Choosing a Lawyer Based on a Single Telephone Call. Why not personally interview your potential lawyer before retaining their services? By interviewing the lawyer in person, you can evaluate their knowledge and skill level in handling personal injury or workers’ compensation cases. That way, you become better acquainted with them and their qualifications. Attending a consultation also allows you to ask important questions about the specifics of your case. This can give you a much better understanding of the process and what you can potentially expect moving forward. Mistake #3: Being Intimidated Solely by the Fact That the Attorney Has a Degree and You Might Not. In the good old days of medicine, patients listened to whatever the doctor said as though it came from on high. In today’s society, every patient asks questions regarding their health. The same should be true when you're receiving legal advice. Don’t be intimidated by what any lawyer might say. Instead, ask a lot of questions so you can know what to expect. Mistake #4: Choosing a Lawyer Who Isn’t a Member of a Professional Association Such as the Ohio Academy of Trial Lawyers. The Ohio Academy of Trial Lawyers is a trade association of Ohio lawyers who are dedicated to protecting the rights of injured people. Membership in this and similar professional organizations demonstrates that a lawyer is dedicated to his craft enough to engage in professional development with their peers and that they're aware of the latest changes to the laws impacting your case. Mistake #5: Choosing a Lawyer Who Is Unwilling to Advance Litigation Expenses under Any Circumstances. Face it, litigation can be expensive. You may not be able to afford the expenses of litigation. If you can’t afford expenses and your lawyer won’t advance expenses, then you are pretty much stuck with taking what the insurance company offers. Find out if the lawyer you are thinking about hiring is willing to advance litigation costs. Most injury lawyers will advance these costs and then recoup their expenses from your settlement. If the attorney you're talking to won't do this, you will easily be able to find someone else who will. You're already dealing with costly medical bills and other expenses associated with your injury. You don't need to be saddled with litigation expenses as well. 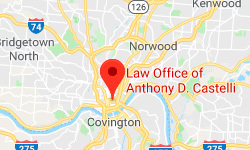 Please contact the Law Office of Anthony D. Castelli using the form on the right side of the page or call (513) 621-2345 today to schedule your free personal injury consultation. Mr. Castelli serves clients in Cincinnati and throughout Ohio.